When you weld guns and armor onto a race car, you need some real psychos to drive them. But we did it. Why? A race where anything goes and with room for only one on the podium. Break-neck speed and road-rage are not only encouraged, they are required! 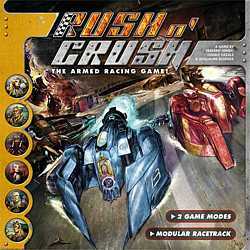 The only ways to finish Rush N’ Crush are as the winner, or as one of many losers. The first driver across the finish line wins, the rest clearly haven’t got what it takes to be on the Rush N’ Crush track. Though before its over some may definitely be left on the track. or a loser with a soap box pedal car?